About half-an-hour into Rouse, Ye Women! at Seven Arts in Chapel Allerton, I realised I was, like most of the audience, joining in a bit of a sing-along. The performers of this ‘folk ballad opera’ had such joie de vivre it was impossible not to be swept up by their enthusiasm. Townsend Theatre is a small production company which tours its shows throughout the country in a range of venues. It focuses on ‘the lives and contributions of inspirational and pivotal figures from our social history, often forgotten or overlooked, who campaigned vigorously to improve the quality of life for everyone.’ (programme notes). Rouse, Ye Women! is about Mary Macarthur and her fight in the 1900s to gain improved working conditions and wages for the women chainmakers of the Black Country. Three versatile, engaging performers tell the story in song and words, accompanying themselves on musical instruments. John Kirkpatrick’s original music, catchy and direct, blends well with more familiar traditional folk tunes. The main musician, Neil Gore, is also the writer of this informative, sometimes poetical and always entertaining piece. Bryony Purdue in Rouse, Ye Women! 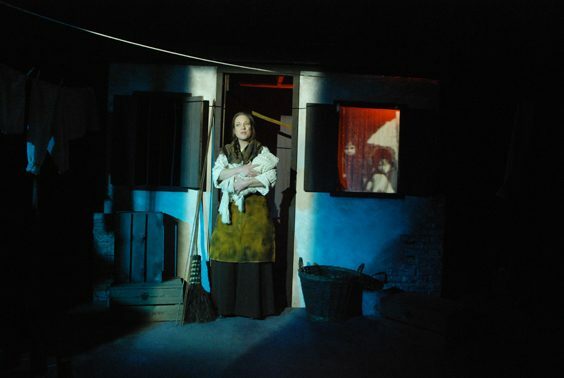 The first half introduces us to Bird, played by Rowan Godel, working behind the barred window of the tiny forge alongside her house where she makes chains 12 to 13 hours a day while she also tries to look after her children. Godel hammers away at her work as she sings in a pure, crystal clear voice of her daily drudgery. She’s at the mercy of a middleman, a ‘fogger’, who can dock her meagre wages or fire her at a whim. Neil Gore is strong as Albert the fogger, a manipulative villain, the twinkle in his eye belying his abusive behaviour. Enter Mary Macarthur, an educated middle-class suffragist and trade unionist. 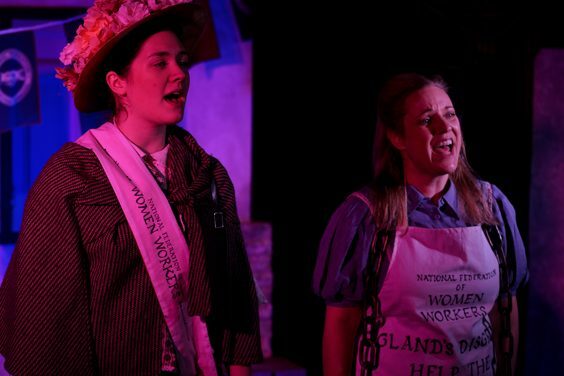 As played by Bryony Purdue who completely inhabits the part, Macarthur is a compelling figure, moved to tears by the plight of the chainmakers who, she tells them, are ‘giving away the roses in your cheeks, and the sparkle in your eyes.’ She casts the audience in the role of the chainmakers and explains the need for trade unions with a simple analogy: one worker is like a stick, easy to break; a union is like a bundle of sticks bound together, much stronger. Purdue’s rapport with the audience is so captivating that we metaphorically sign up to her union, the Nation Federation of Women’s Workers (NFWW), by singing alongside her in rousing choruses. We feel Macarthur’s passion and understand by our own engagement how Macarthur managed to unionise the workers, and then helped change the law in 1909 to give more rights and a guaranteed minimum wage to the chainmakers and other women workers. Somehow the audience’s sing-along symbolises unity. The second half shows how some employers tried to evade the new law and describes the consequent 13-week chainmakers’ strike inspired by Macarthur, who also raised a strike fund through newspaper articles and influential contacts. ‘The fundraising song’, inventively punctuated by the clacking of a typewriter, is one of many that make a lasting impact. Mary Macarthur comes across as remarkable woman: she’s embodied by a remarkable performer who, I imagine, could very successfully lead a few present-day campaigns. And her effect on ordinary women is beautifully communicated by Rowan Godel in the final song, ‘Singing Bird’. Once an angry but ineffectual single worker, Bird is now a proud and victorious trade unionist. Godel has taken us on her character’s journey with conviction. The show is unapologetically pro-trade unionist and draws obvious though unmentioned parallels with present-day social inequality, but has none of the thrusting rant of traditional agit-prop because its message is so well-constructed and theatrically communicated by the company. It focuses on human interaction between characters and with the audience. In Chapel Allerton, it was probably preaching to the converted but I think it has the power to change minds. As well as sporting an excellent cast it has extremely high production values: each element of Rouse, Ye Women! adds to the overall drama experience. The sepia tones of the set and initial costumes suggest the bleak historical context; Macarthur’s bright outfit conveys simply but effectively the light and optimism that her character brings to proceedings. 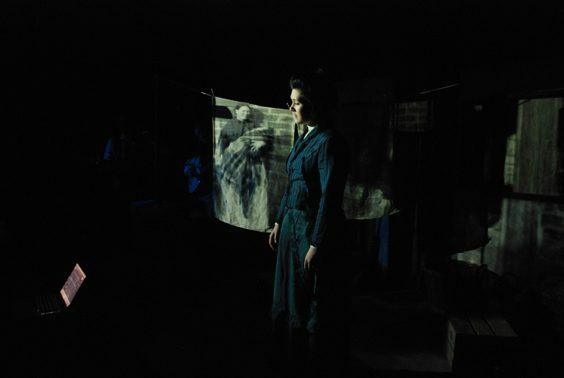 For a small touring company to produce such an effective travelling set – the frontage of a humble dwelling, Macarthur’s desk and a few soapboxes – and such atmospheric lighting such as the flames of the metal furnace, moving images of chains, fuzzy portraits of workers’ children shows inspired resourcefulness. I’ve never seen a Townsend Theatre production before but I’ve just signed up for their newsletter. In such divisive times as we live in now, this reminder that unity creates strength is not only important but uplifting. Director and Producer, Louise Townsend and her team have created a highly satisfying and exhilarating theatrical event. A real tonic.